Backpacks, bulletin boards, desk calendars and white boards are all items normally found inside a classroom. Would making them bulletproof, so they can be turned into shields, save lives in a school shooting, such as those that happened in Newtown, Conn., and, closer to home, in Chardon and at Cleveland's Success Tech Academy? Bullet-proof backpacks for your child? It's back to school time, meaning it's time to buy your child's supplies. Books. Pens and pencils. Paper. Clothes. Protection from a .44 Magnum. Add it to the back-to-school shopping list: bulletproof backpacks. Throw in a bulletproof whiteboard and a bulletproof desktop calendar, too. That's the pitch from Cleveland-based Impact Armor Technologies, one of af ew companies in the United States marketing safety gear once reserved for police officers and soliders to teachers and schoolchildren. 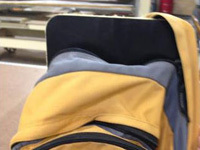 School safety consultant Kenneth Trump said fortified backpacks are simply not practical. "I often ask, if you need a bulletproof backpack, are you going to need a bullet-proof frontpack as well? Are you going to get a bulletproof helmet to go along? Are you going to train the student to take a Captain America stance and defend himself?" School should be a safe haven for children and teachers. But sometimes it's become a dangerous place. Gun violence in schools is occurring in cities big and small, and there's no warning or advance notice. Impact Armor, which specializes in bulletproof products, has created a full line of bulletproof school safety products for schools, and the products are made in Cleveland. 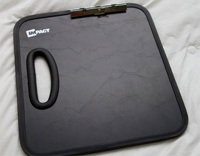 A clipboard sized shield, made by local company, Impact Armor Technologies can be a life saver.